Visited an old friend working in KL Hilton the other day. 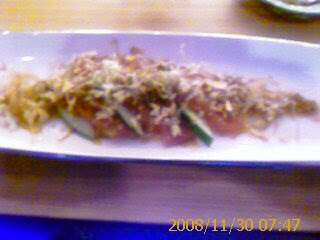 As he was working at the Japanese Restaurant (IKETERU), i decided to sample some of the dishes available there. The restaurant itself is divided to three areas which is the Teppanyaki, Sushi and ala-carte dining. 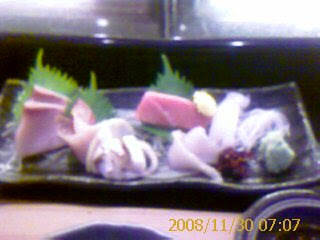 For that day i decided to sit at the sushi bar and enjoy the offerings there. I was lucky enough to be introduced by my friend to Chef Voon, the Sushi Chef himself and luckier when my food was prepared by Chef Voon himself. Not everyday that you can indulge your palates by the master himself. The picture above is one of the items that was prepared and reccomended by Chef Voon. It is 'Tuna with Momotaro tomatoes topped with Bonito Flakes in Special Sauce' The chilled tuna i don't have to describe because it's taste is perfect. The intersting part is that the Momotaro tamotoes are a species which originates from Japan but now are grown at Cameron Highlands. You have to eat the Tuna together with the tomatoes to get the full flavor of both. The bonito flakes adds crispiness to the dish. But the main factor which is the sauce which gives full flavor to the dish. Thumbs up for this one. The dish above is created by Chef Voon and he presented this complimentary to me to try. 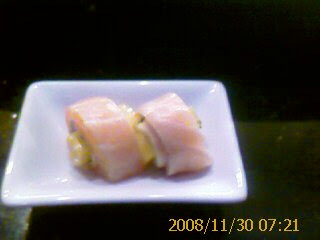 It is 'Salmon wrapped over Cheese and Manggo'. My verdict. Delicious!. The flavors of the tuna mixed with the saltiness of the cheese and sweet taste of the manggo erupts the full flavors in your mouth at one shot. No soya sauce or wasabe for this one. It's supposed to be eaten on it's own. This is my favorite dish wherever i go to a japanese restaurant. Unagi.. eels.. some of you mught not like this but for me.. i just love 'em. 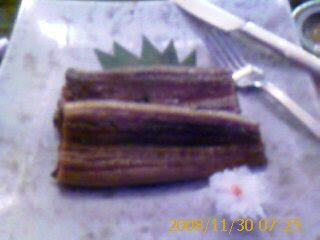 One of the best unagi dishes that i have ever tasted. Just the right combination of kikkoman and the other ingrediants that made this this perfect. How much does it cost? RM 58++. But worth every cent of it. All in all this Restaurant is really a good place to wine and dine and worth every cent you spent. Mad Man..? Or Just a Mad Romantic...! Towards to be a Quality Person.